When you hear metrics like “380% increase in upgrades from free to paid accounts”, you pay attention and raise a skeptical eyebrow. And then, we dug in deep to figure out not just how one company did it, but to learn from the growing number of SaaS companies who are quietly using the same model today to reduce churn and grow revenue, without adding a single extra lead to the top of the funnel. A few months ago, Wishpond, a Vancouver-based SaaS company serving over 100,000 business customers and counting, invested a single 10 day sprint in developing Wishpond Academy. This on-demand training hub on the Thinkific platform (Thinkific makes it easy to launch your own online courses) was designed for customers and prospective customers looking to learn not just what their product did, but how to do it. They already had a comprehensive support site for regular questions, but Academy was something new entirely. Getting a customer to create an account is only half the battle. If a new customer doesn’t get real value out of your product — and quickly — they’re gone. The goal was to bridge the gap between acquisition and activation with an engaging training experience designed to ensure that each new customer had the knowledge and confidence they needed to launch new campaigns — and hit their first WOW moment — in the shortest possible time. Education and Training may be boring words, but Revenue is not. The results were almost instant, and indisputable. Customers who had accessed Wishpond’s online training courses were upgrading from trial to paid plans at a rate 380% higher than customers not accessing the training. Three hundred and eighty percent. Interested in learning more about how Wishpond did it? Read the full case study here. Wishpond is not the only Thinkific customer realizing similar results, but we were more interested in learning about how SaaS companies across the space are using education for growth, and what lessons can be learned from their success. We reached out to 50 top SaaS companiesto better understand how they are onboarding and educating their customers, from tiny startups to fast growing unicorns and enterprise solutions alike. In between content marketing and support, there’s a whole category of education that only a few SaaS companies have fully unlocked. As organizations, most of us are churning out a tonne of content. The problem we found, however, is how and when that content gets into the hands of the customer. It turns out, that’s a detail significantly more important than you think. Content Marketing. This includes your blog, white papers, webinars, and all the other lead gen and related content your team is producing. Primary goals include customer acquisition and customer engagement, with a large focus on writing for an external audience. Customer Support. Once a new customer has signed up, your support resources are there when customers hit a wall and need your help. This looks like your customer knowledge base, support forums, and direct 1v1 customer support (chat, email, or phone). Proactive customer success training is delivered through online courses and on-demand training designed to get your new customers up to speed from acquisition to activation in as short as possible timeframe. It’s delivered proactively not reactively — BEFORE your customer realizes they have a problem they can’t figure out how to solve. While content marketing education can be a long play, training as part of onboarding is a near instant one. Most companies already have a lot of the content that their customers are looking for, and think they’re doing a good job here. It’s just not delivered in the right place, at the right time. Most education content is based on the customer needing to identify that they have a problem, and then seeking out the solution. They have to pull it, and it can be incredibly frustrating for those new to your platform. In order to get the most out of this type of support, your customers need to identify that they have a problem, they need to know the language to describe the problem, and then they need to search for the answer in your support forum or knowledge base. These support resources are vital, but the challenge is that they’re designed primarily for customers who are already familiar and working with your system. Conversely, customer success content and training is pushed to customers as the first step after they sign up, and is prominent throughout the system as the best available choice for learning both BEFORE they dive in, and as they progress through your product and encounter new features, or are ready to learn new functionality. This type of education exists as courses, tutorial videos, and even hands-on training. And as it turns out, it’s not that difficult (or expensive) to deliver. Customer success content answers questions like “I’m new, where should I start”, “What do I need to do to start my first campaign”, and “Tell me what I need to know about using the system to engage with my users”. sign-up to power user, without their needing to reach out for help. Companies like HubSpot, Vidyard, and Infusionsoft figured out the value of proactive customer training some time ago. These companies not only deliver excellent, proactive customer success education, but they have identified it as so important that they’ve made it all but mandatory. With big-ticket services, the cost of each churned customer is high. By proactively educating their customers on their systems, they are doing everything they can to onboard customers as quickly as possible, without forcing them to ask for help. When was the last time you voluntarily chose to stop and ask for directions? Are you still making your customers do just that? Groove looked to their new customer data when they set out to reduce their own churn. One key learning for them was that for customers who subsequently churned, they found that many of them had spent significantly longer than average on a specific task. For example, if it normally takes 30 seconds to integrate a Twitter account, a customer at higher risk of churn might have spent 2 or 3 minutes on that task. Their customers were getting stuck, and they weren’t reaching out. If they can give you a list, you’ve just found your 1st training opportunities. Are you silent and just watch — all the way to the point of them hitting publish, launching a campaign, or running a report; or do you guide them through the process? Do you give them a walk-through up-front, or ask what they want to accomplish first, and start there with your tips? Do you start with a blank slate, or is it easier for them to grasp if you pull up a demo with some live content and data? Leading SaaS companies are delivering that same hands-on experience to every single new customer — hundreds & even thousands of times over, without the need for 1 on 1 resources. 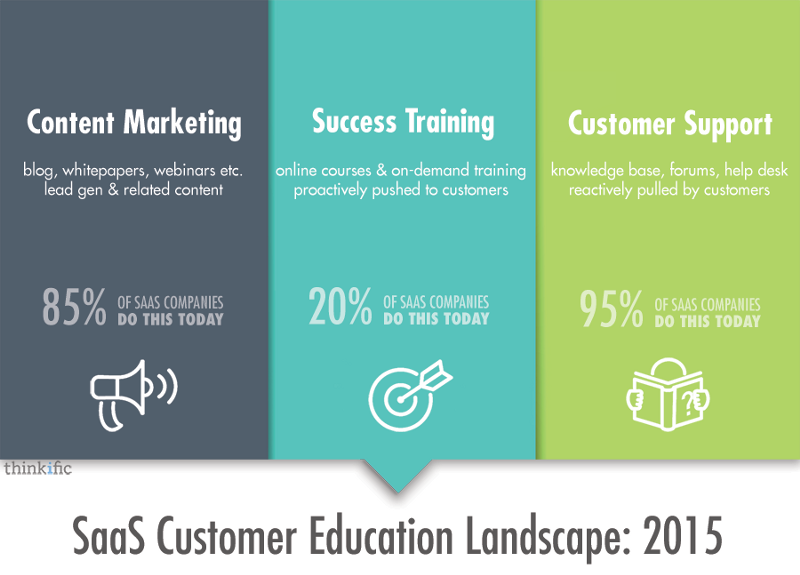 20% of SaaS companies have already started, and are proactively delivering on-demand customer success training now. 50% of SaaS companies aren’t delivering support training at all, and are relying on content marketing and customer support to drive their customers to success. 30% of SaaS companies THINK they’re doing this now, but aren’t.These folks typically have some great content created with the right stage of customer in mind, but it’s not proactively available for their customers when and where they need it.